I Love It When They Stab Me! I love it when they cut, stab, drill and peer into me with their cruel machines. I literally exult. I consider myself among the most privileged persons on the planet. Later I remember their tortures with the greatest fondnesses. She pulls my mouth open with her fingers, slides the needle into my jaw gently and says, “Relax.” Then she starts humming in the way that I like. He takes the top of my head with both his hands, firmly rotates it, and then with his right hand he cuts me. “Excellent,” he says. I agree, as I always do regarding his work. It’s why I keep coming back. Instrument, utensil, implement, machine, device, and apparatus — tools and the people who skillfully manipulate them — these greatly improve our lives. We who are resourced, we who have multiple, modern armamentariums at our disposal, we who can hire dentists, surgeons, hair stylists, mechanics and optometrists, we live so well, better than any ancient royalty. Healthy care, beauty care, eye care, car care, soul care — if you have it, suffer it gladly, you proviledged elite, you resourced rich, you spoiled pampered. Complain not that you have to go to the doctor or dentist; that’s unenlightened. It’s ungrateful. For every time they stick a needle or drill or scrapple into you, for every time you get your hair cut, for every pedicure and pill and partial panacea that blesses you — be thankful. Contentment is a great feeling, unless it stifles excitement. You can get too contented and fall into apathy or indifference. Perhaps you are there if you are no longer excited about stuff like tonight’s pork chops, next year’s vacation to the great Northwest, putting up the lights this Christmas or something along the lines of your next new friend — or precious love. Excitement; it’s an ignitement! Boom! Recently I drove a 2013 Infinity G37 sports coupe — 330 hp, sharp steering, Bose sound system. It growled and yowled; I howled! I like being content, kicking back with what is, making friends with reality. Today I was very content with my cats. They were such a finality of furry finesse — dipped in black, doused in fluffy, immersed in sleepy, lions couchant on my lap. They make me purr. I also like being discontent, with things that need to change. I like making plans, making changes, creating a new future, crafting something better. Last week I bought a new but affordable espresso maker, a burr grinder and a tasty blend of locally roasted coffee. This morning, I was excited about better lattes — and not paying coffee shop prices. After drinking a double shot of Dark Horse I was even more excited. I love it when a good plan comes together — on my tongue, in my brain. I might go to Nappa Valley this spring, tagging along after my wife, the archivist, as she goes to a work conference — my own bookish true love setting the pace for us as she so often does. I like following her around, especially to wine country. I might buy that used but yet fun G car, I might write another blog post, I might plant some flowers in the new courtyard at the church tomorrow with my botanical friend Brenda, I might wash my black cat Megan — soon. She needs it: she wants it. There is so much hope when we try things, when we enjoy stuff, when we just go for it. I’m excited. I need to pick a date to take my friends to see the wild flowers in the dessert this spring. I want to take a bunch of them. I don’t think I will need any coffee to put those new countertops in the bathroom later this year. I can’t wait to go to work today. We might put the new gates in the halls this week! Where is my check book? I want to make that donation to my favorite charity — the one I work for. I’m jived! I can’t wait to see people today! I cannot wait to not judge the next person I see; I can hardly stand it as I anticipate telling them that they are amazing. I want to empower everyone I can! Where is that set of drawings, who is my next best friend? What do we get to do next? Where is that dill pickle? I can hardly wait for eternity. I’m excited about a life that just keeps on going, about a God who just keeps on loving, about friends who are always there and never leave. Excitement — I don’t think you can’t overrate it. Most of reality is unnamed. Consider the lack of names for various and odd spaces. A balbis is an H shaped thing, but what is a simple, one-word name for an empty space between a bed and a dresser? We see such a space often, but we have no name for it. A squircle is a combined square and circle, the shape of iPhone apps, but what do we call the space between two tree trunks? Some languages do better than others at getting at unnamed stuff. In German, the excess weight gained due to emotional overeating is called kummerspeck, literally, “grief bacon.” But what do we call the last bite of a delicious food that tempts us to have one more bite? The Japanese note a difference between what one must claim to think and feel in order to fit in with society, and what one privately thinks and feels. They call this tatemae and honne. But what do we call the thoughts we borrow from others and then mingle with our own tangential thoughts to produce something neither ours nor theirs? The Scotts call the moment of panic when you are introducing someone and realise you’ve forgotten their name a tartle. But what do we call that moment of panic when we call them by their name and then realize we have gotten it wrong? It may be argued that the realities we don’t name we don’t discriminate from other realities. Generalizations gloss over nuances and leave them hidden. Space is an inadequate word for the area between our fingers, and because we don’t have a common name for this, and because we don’t talk about this space much, we may actually see it without really seeing it. Life is filled with this kind of seeing what we don’t see, seeing background, seeing empty space between objects, seeing pieces of things not noted by the name we have for their whole. What is the word for the space inside the fold of a fabric? This is such a beautiful space, so common, so lovely in a Vermeer, so delicate on a sleeve, so gorgeous in a curtain in a breeze-blown window. I love the unnamed spaces of life with a love that I can’t name or define. The space under an umbrella — it has a safe, fun, social, protected feel to it. The space within a cat’s fur — it has a soft, dense, silky, warm feel. The space between two people when they are having a good talk — it has a close, combined, focused, secure feel. Perhaps, to be less bored, to be more aware, to see more beauty, we should go looking for what’s unnamed. What’s in a nameless thing? A nameless flower by no name still smells as sweet,or does it? Everyday, in every moment, there is a possible adventure, the essence of so many unnamed realities waiting to be discovered, both spiritual and physical, emotional and social waiting to be noticed, waiting for us to softly and reverently enter in to — and name. The Real Trick is Paying Attention — and Not Worrying! That was the whole point of the thing — the swirling, milky Andromeda galaxy; the flaming red Ocotillo against the cornflower blue sky; a crisp, white quarter moon; a perfectly pink, finely needled pincushion cactus — and not thinking about my dental appointment next week. Sometimes it is so freakin’ deliciously and precisely, so fix-brainedly, knob-focusedly, fine-tunedly all about paying attention, which means not remembering and not imagining. Sitting around the fire that evening I assembled Dale’s telescope on my lap. It was operating-room team work. I honored each piece of technology with nomenclature, a moments-techno-touch, a loving-looking-pause. We know the names of what we take the time to see. We flipped a lawn chair on its side and made a table for the telescope. Boom — there were the mountains and craters of our mad-circling moon, in crisp, blazing white — always there, seldom wooed, never won. And then later, after we had talked the dry dust, desert wind and gas fire into oblivion — sighting the scope off the car hood — we ogled the moons of Jupiter, glittering in a row next to the giant planet, posing there for us in a way we could take in, the size of an @ in an email address. Awareness is the thing, conscious, woken-up, fix-eyed, mind-sighted, calibrated awareness, in the moment — not tomorrow and tomorrow and tomorrow. As we sat over dinner earlier in the evening, I made a conscious decision to take in the moment — the pianist, hunched over his swirling, finger-tipped atmosphere, the mushroom crusted scallop posing on my fork, our friends all holding knives while spinning stories of the children we have named, of calving glaciers and orca whales. We weren’t thinking about the possibility of any of us getting cancer. The other day I noticed that when I post a set of my freshly crafted modern proverbs on my website, I do so by touching the screen of my iPad, copying them from my “notes” program with my finger tip and then springing them — again from the tip of my finger — into a new post! Bam! — my finger-wand casts word-wisdom into the waiting world. I reach out, riding on a cloud, finger extended — and living in that moment and no other possible one — I create, my world! This morning my wife and I sat outside our room and watched the sun come up on the mountains in the Anza Borrego desert. Bright light flooded the alluvials and tipped the peaks. The real trick is paying attention — and not worrying. 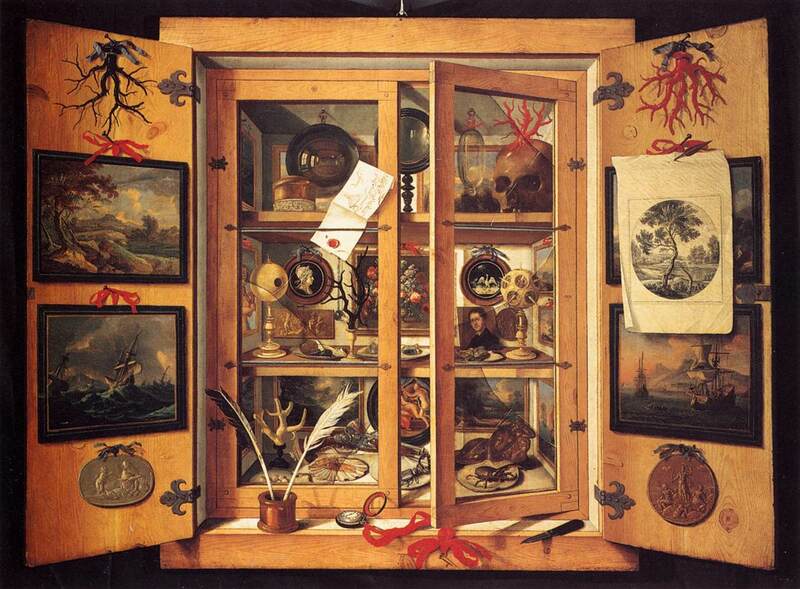 The early practitioners of science in Europe formed collections, cabinets of curiosities, bits and pieces of art, natural history and antiquities. The boundaries of these early collections were undefined — fossils, shells, a stuffed mammal, some minerals, plant specimens, a tusk. These cabinets were the precursors to museums, which have become very popular. But our human tendency to collect was the precursor to the collections. People tend to gather stuff — food, Christmas ornaments, clothes, junk anything. There is an asphalt museum in Sacramento. Ever help someone move who has lived somewhere more than five years? Overwhelming. I was in the Louvre recently. The collection thing has gotten out of hand. I got lost, hunting treasures among the treasures. If you have never been lost in the Louvre, then you have never been to the Louvre. I walked by the Venus d Milo so focused on my map that I didn’t see her the first time by. Travesty! She is so fine; it is absolutely de rigeur that she be ogled by the girls and boys alike. I have a box of arrowheads in my garage. I gathered them when I was in grade school. I got the idea from my school bus driver, who was also a farmer and collected the Indian artifacts he found on his farm. One day, on the bus, he gave me an arrow point he had found in a field. It was almost perfect, but it had the tip broken off. How did the tip break off? I used to walk with my eyes down, looking for more mystery. My bus driver also gave me a smooth, soft red rock. War paint! I’m impressed by Hans Sloane, an 18th Century London physician who put together a really nice natural history collection along with some other curiosities. Upon his death, it became the foundation of the British Museum. I like Hans; he is my type of guy — one fascinated by arrowheads and by making a cabinet of wonders. Hans started something good. I’ve been to the British Museum, and the whole thing has progressed quite nicely to say the least. Wow, do I love the winged lions from ancient Assyrian, five meters high, five legs strong — grey, stylized stone gone super-powered. Hans would be thrilled by the big kitties. Thrilled gets at it. It’s all about the hunt, the find, the thrill of the interpretation. Several nights of my life I have had dreams: I am on my knees, digging in the earth, and as I dig, I uncover a hoard of arrowheads. I keep digging quickly with my hands, and I uncover more and more perfect arrow and spearheads. Cool! It is the adventure of living in an old world, treasures lie buried in the ground. One of the colossal lions in the British Museum was excavated in Iraq by Austen Henry Layard in the 19th Century. He enjoyed the dig and the thinking that comes after. Part of the fun in this kind of thing is figuring out how to interpret the things found. Austen suggested that the giant cats embodied the strength of the lion, the swiftness of the bird (indicated by the wings) and the intelligence of the human head. The rap on these divine creatures is that they protected the Assyrians against demonic forces. They didn’t; the Assyrians were brutal killers. Demons of violence controlled them. Whatever the interpretation of the artifacts, the Assyrians lions are awesome and the British Museum is some cabinet. If Hans knew, what it had all come to, he’d go wild. But not everyone is happy, Iraq for instance. The Brits have their stuff. And the Greeks are not that happy with the British Museum because the collection includes the Elgin marbles taken from the Parthenon by Lord Elgin in the early 19th Century. Now the Greeks want them back, and they have built a “cabinet” to house them, the New Acropolis Museum in Athens. It’s the power struggle again; it keeps showing up, even in the arts. Somebody should figure out a win-win regarding the Elgin marbles; we need to put these historical artifacts in range of as many people as possible. Museums are crucial for all of us. I’ve been to the Holocaust Museum in Washington D.C. I walked out with my jaw set, and I said very clearly on the steps outside, “This should never have happened.” I got it. I hated what was done the Jews. The museum got it for me. But here’s the rub: not everybody gets to go Holocaust Museum in D. C. or the British Museum in London. It costs, if not to get in, at least to get there. But historical cabinets aren’t limited to these cities of course and there is something else to understand about cool stuff. In Paris one day, we rode the metro down to the Grand Plais to see a major exhibition of Monet, excluding 53 paintings taken from the Muse d Orsay. We were very excited. We could hardly wait, the cathedral at Rouen, more water lilies. But through a bit of confusion and a miscalculation on our part, it didn’t happen, and we were left standing outside the Grand Palis empty-handed. I was depressed, which was the only valid response possible, considering Monet and his work, but as we turned away, there along the edge of the walk — Chrysanthemums. They were big, beautiful yellow explosions amidst dark green leaves. It was fall, and the trees were losing their leaves and some of them were bare and so the Chrysanthemum were a startling contrast to the other plants in decline along them. I was smitten; I started shooting pictures, from every angle capturing the eight to ten blooms glowing like suns in the midst of falling leaves and dying plants. It was like uncovering a trove of arrowheads — lovely, unexpected, astonishing. My daughter, remarked from the sidelines, “You didn’t get to see the pictures, but you got to see the real thing.” We haven’t all been to all the great museums, but not to worry, the world itself is a cabinet of wonders. We don’t have to go; we just have to open our eyes to see. G.K. Chesterton, in his classic little work Orthodoxy, wrote of the human “instinct for astonishment” that children possess and is resident in the fairy tales. He remarks that most of us are astonished when the door is opened and behind it is a dragon. But the little child is delighted and astonished just to have the door opened. It is an always so; every door opening is amazing. Since I have opened myself to God and all his wonders, I seem to be regressing. As I’ve grown older the world has become to me, more and more enchanted. Perhaps like Merlin, I’m now living backwards in time, growing younger with each year, every door opening becoming more and more exciting. As a little child I loved the fire flies in the field in Missouri out front of the house, the glass-smooth water of the Osage river that we water skied on in the evenings, the arrowhead that I found on the ground, the fallen tree fort I played in with my brothers, the beauty of the silver icicles hanging from the roof cabin that we lived in Missouri. But now I don’t need an icicle or an arrowhead. Today, driving down H Street, I absolutely exulted in the light blazing on each and every Magnolia leaf in the center divide. The trees on the steet to my house open the door on the astonishing world of light. Light, light, light — I wish I had been instructed by the Impressionists earlier so that I could have been noticing it longer. If only Renoir had been my childhood friend and taught me color, the way my friend who was always drunk taught me the chords on the guitar, I might have seen into the cabinet of wonders deeper and earlier. I see it, the grandeur, the flame already burning, the already shook foil. This is not because I am up to Auden; it is because I live in San Diego. To live in San Diego is to live in the fire and to live among jewels. In Shakespeare’s Measure For Measure, Angelo says, “The jewel that we find, we stoop and take it,/Because we see it; but what we do not see/We tread upon and never think of it.”The precious treasure that we San Diegans walk on daily is the sun, the fiery jewel that fills the cabinet here. Sun, sun, sun – in this town we walk all over the cabinet of wonders. Here we must always be checking the bottoms of our shoes to see that they aren’t melting. We bask in sunshine about 70% of the daylight hours. City hall scandals, half-a-million dollar house prices, Qualcomm stadium, Balboa Park, the San Diego zoo, Sea World – all and more make up the local identity, but it is the average daytime temperature, the 70.5 degrees, that best defines this city. The essence of San Diego, in the long run, is what piles up on the red tile roofs, covers the sidewalks and fills the potholes in the streets most everyday – sunshine! One of the primary lessons the impressionist painters taught is that we can catch light on flat surfaces, lakes and fields and buildings. 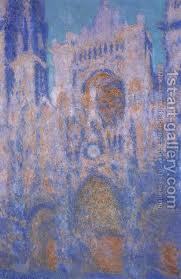 In 1892, Monet rented a room opposite the Cathedral of Rouen and painted the church’s facade over and over again. Each painting is a unique study in light, because with the changes in light, the colors and angles of the walls were ever-changing. San Diego may not house a great cathedral or a massive museum, but its downtown architecture is a great sun catcher. In the afternoon the huge windowed walls of San Diego’s buildings turn into great sheets of fire as the sun sets over the Pacific. Solar fire falls onto all unblocked offices and homes facing west. Every window becomes the sun’s picture frame. Some places in the world are defined by ice. San Diego is defined by fire. It’s all over the place, like arrowhead stored in the ground. On a sunny afternoon, the edges of the city, an overhead street sign, the top of a building, a fender speeding down the Interstate 5 – all turned to California gold. A custom wheel spins the local yellow star into a perfectly straight thread of gold. Here, the ordinary commute home is a solar fantasia worthy of the great museums of the world. It is not different anywhere. If it is not the sun, it is the ice. I flew over Montana last night. From the plane window I could see hundreds of miles of snow and ice sculpted mountains and lakes. No sculpture in the Louvre is better done than the ice-covered mountains of Montana. Last year I stood in a field of sand verbena in Anza Borrego desert. The brilliant pink and purple flowers were master work, the envy of any great collector anywhere. John Bartram would have been stoked. Today I drove over to the college to pick my daughter up from class. At a stop light, I glanced over at the face of the girl driving the car next to me. She was talking to a young boy in the passenger seat beside her. Her face glowed with animated enthusiasm and the joy of life. She was an artifact, an icon, a perfect specimen, a bit of grandeur, a jewel, the glory the cabinet. It is always like that, wherever we go, the doors open and out flow sunshine, ice, flowers, faces — these and so much more, fill the cabinet of the world with wonder.